for people of all ages! Read below on why Swell Cabarete Surf Camp is a great destination for you if you want to learn how to surf on your vacation. You've worked hard all year and you've got limited vacation time. You have always wanted to learn how to surf, but always thought: it's too difficult / it's for young people / you have to be super fit etc. etc. Here at Swell we have taught 1000's of people the sport of surfing in a safe, fun and structured matter with our 5 day learn to surf course that includes theory surf lessons as well. "But i'm 40-50-60-70 years old, surely i am too old to learn surfing?" The short answer: no, age is not a problem! Well in fact being able to swim is not even a requirement at certain surf destinations around the world, but since we at Swell teach in water that is generally between waist and shoulder high we do want people to be able to swim before they start our learn to surf course. At Swell surf camp, our surf lessons are given in groups in a structured manner, using properly I.S.A. qualified surfing instructors. We set up a 5 day learn to surf course that takes place at Playa Encuentro. We use qualified surf instructors that speak English as their first language. Most other surf schools and surf camps just focus on 1-2 days of surf lessons to make sure that the client manages to stand up on a board at least once. At Swell we want to make sure that when you leave the Dominican Republic you can not only stand up on a surfboard, but continue your surfing career at your local beach in a safe and fun manner. Get up at 6.30 for the first morning session. Taxi takes you from Swell to Playa Encuentro. Surf lessons or session until 9 at Playa Encuentro. Delicious fresh cooked breakfast at Swell. If the conditions are very good and glassy we might go back for another surf for a sunset session. Chill at Swell until dinner is served or go in town with the other clients for a nice bite to eat. Maybe a few cold Presidente beers at one of the bars that’s within walking distance. Back to Swell, good night sleep in comfortable beds. Besides the above for a typical learn how to surf with Swell Cabarete Surf Camp, we also offer learn to kitesurf courses, yoga classes (Read the article 10 ways you can benefit from going to a surf & Yoga Retreat ). 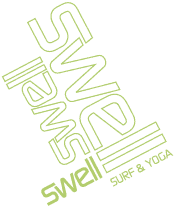 If you have any questions about learning to surf with Swell, have a look at this page, or send us a message. Ready to see the packages? Check the learn to surf packages swell offers.